* “State-of-the-art” gradient forming and optimal reproducibility for optimal multidimensional HPLC+HRGC operation. KONIK has been designing HPLC’s since 1985 when pioneered the introduction of the first low pressure mixing system, based on the isokinetic flow delivery patent, against market tendencies. The latest KONIK models, the low cost and flexibly modular 560 HPLC tower, and the Model 600 HPLC, incorporate the latest innovations. 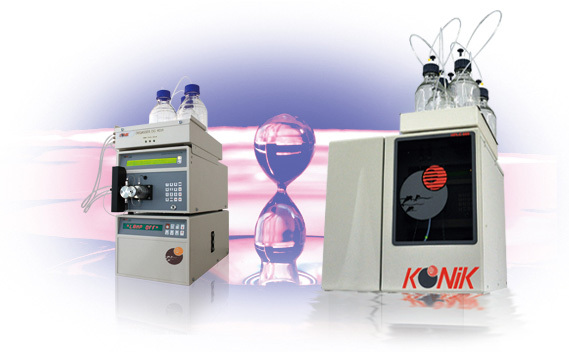 KONIK Model 600 HPLC has been designed to facilitate multidimensional HPLC-GC method development. It includes a fast heating and cooling multi-ramping oven, likewise the GC ovens, and sample back-flushing as standard to facilitate column clean-up. Both features have found its place to increase productivity in standard HPLC applications as it shortens total analysis time. The KONIK HPLC systems use the ROBOKROM Autosampler, common to the GC lines minimizing the use of spares when both techniques are present on a laboratory. The high pressure rating of the pump (up to 10.000psi), its extremely low pulsations and accurate flow control pump at flows down to the the sub ml/min makes it ideally suited for fast HPLC, microbore HPLC and HPLC-MS when coupled to the KONIK Q12 MS.